Is there someone in your life currently who you have been meaning to show some form of gratitude or appreciation and ‘just have not had the time to do it’? Is there someone from your past who you have always admired and appreciated but never expressed it to them? Is there someone who has passed from this life and you lost the opportunity to let them know how much they mean to you? 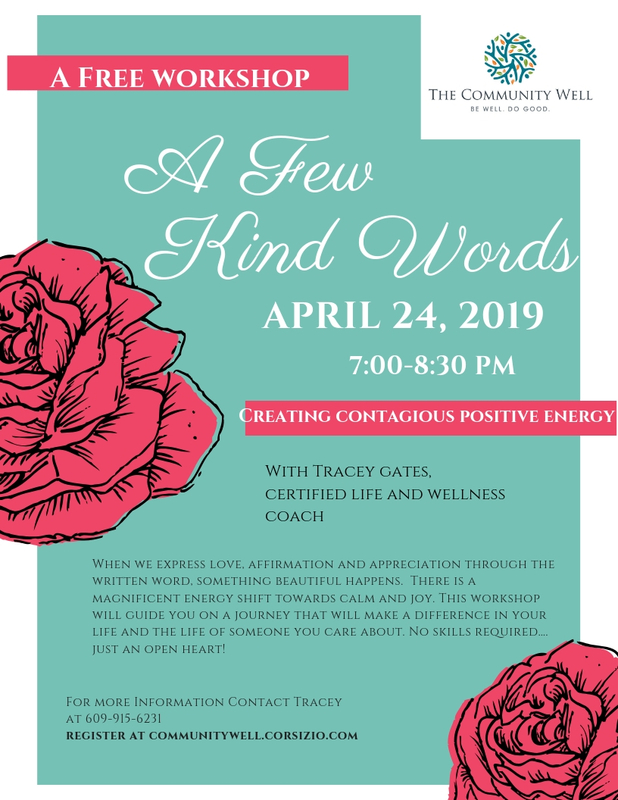 A Few Kind Words is a free workshop to help people tap into the power of love we all have residing inside of ourselves. When we express love, affirmation and appreciation through the written word, something beautiful happens. There is a magnificent energy shift towards calm and joy. Allow Tracey Gates, a certified Life and Wellness coach, to guide you on a journey that will make a difference in your life and the life of someone you care about. No skills required…. just an open heart! Acknowledge yourdeep and innate need for connection through relationships; We are not meant to live in isolation. Experience how easy it is to create positive energy when yousupport and affirm one another. Experience the power of gratitude, appreciation, and mindfulness as you step out of ego and step into your heart. Through conversation, guidance and a 30-minute written exercise, you will tap into your power source of love and share a few kind words, in written form, with someone important in your life.